Writer Jacob Semahn (Marvel Universe Ultimate Spider-Man), artist Jorge Corona (Teen Titans Go!) team up for GONERS, a bold new historical fantasy mystery about a very peculiar family, the Latimer Family, who have been humanity’s lone defense against paranormal assault throughout history, due from Image Comics on October 22. From the colonization of Roanoke to the fall of the Berlin Wall, the Latimer Family throughout the centuries have been the famous first line of defense against all that go bump in the night. The modern-day progenitor, Raleigh Latimer, and his wife, Evelyn Latimer, have turned the family tradition into a profitable brand. Selling life rights and starring in their own reality show, the Latimers have found a way to fund their endeavors against those that would try to overthrow humanity. But on a routine case, Raleigh and Evelyn are murdered on live television, while their children, Josiah and Zoe, are left helpless to watch. With a widening power vacuum, devils and opportunists alike hunt the ill-prepared child detectives for a sound byte or simply… a chomp. "It’s an epic adventure wrapped in ghosts and monsters,” explained Corona. “It takes me back to my childhood, to the movies and cartoons I grew up with. And that is exactly where I’m taking inspiration for the art. Jake did a beautiful job plotting and orchestrating this story, as soon as I’m done with each issue I can’t wait to get the next script. From the beginning Jake and I agreed that we wanted to give the story more than just a narrative style but also a very specific look for the art. It’s a modern day story with a lot of classic horror and science fiction imagery to create a world that resembles ours but hides secrets behind every wall." GONERS invites readers into a world where the mythic co-exists with the mortal, and offers an alternative history where wars, civil rights, and scientific innovation are shown through a warped supernatural mirror. 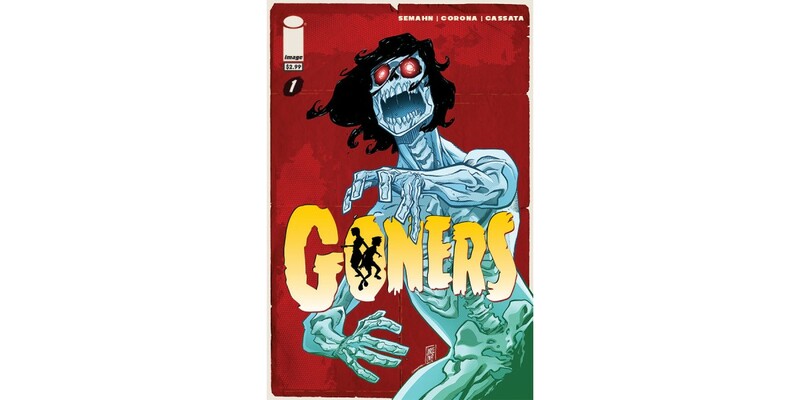 GONERS #1 arrives in stores on 10/22 and is available for only $2.99. It can be pre-ordered with Diamond Code AUG140543.